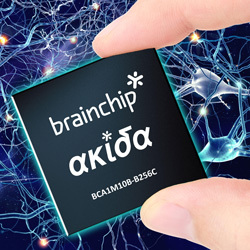 BrainChip has introduced a production spiking neural network architecture – the Akida Neuromorphic System-on-Chip (NSoC) – to market. This architecture claims to position BrainChip as the front in acceleration for AI at the edge and the enterprise. The device is small, low cost and low power, making it perfect for edge applications such as ADAS, autonomous vehicles, vision-guided robotics, drones, surveillance and machine vision systems. Its scalability enables users to network many of the Akida devices together to achieve complex neural network training and inferencing for many markets including cybersecurity, agricultural technology and financial technology.